In a medium bowl combine crab meat, avocado and feta and toss gently to combine. In a small bowl combine olive oil, lime juice, cumin and cilantro and stir to combine. Slowly add dressing to crab mixture and combine. In a medium bowl combine prepared rice, chipotle pepper, fried garlic cloves, roasted shallots, cilantro and olive oil. Toss to combine. Keep warm. In a small sauce pan over low heat combine all ingredients and heat 5 minutes. Remove from heat and let sit one hour. Strain and set aside until needed. Mix well right before using. 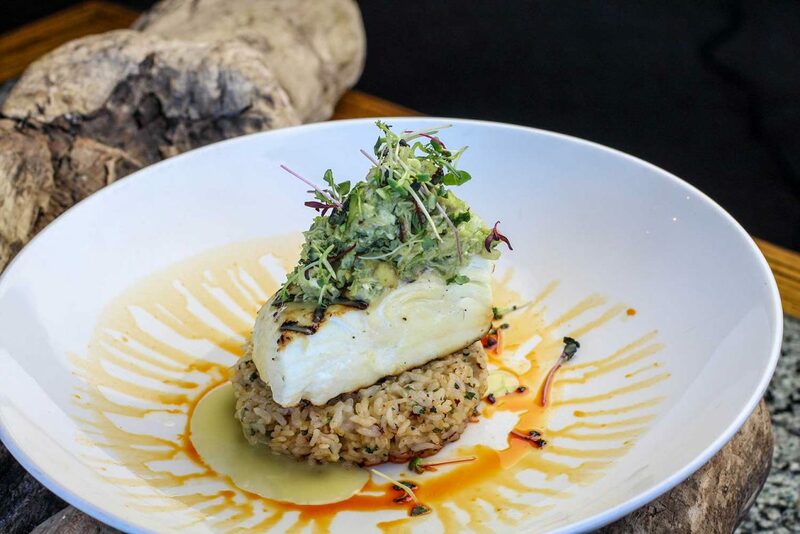 To serve place halibut on center of plate. Next, place a generous scoop of crab salad next to halibut. Add a scoop of Chipotle Rice Pilaf and lightly drizzle plate with Aleppo Chili Oil.